Actually technically it’s legal to be a streetcart vendor in Los Angeles already. You just have to apply about two months ahead of when you’d like to vend, get the approval of every resident and business owner that can see (or smell) your cart, and, oh, you’ve also got to get permission from the Investigations unit at the LA Department of Street Services (DSS) to close down the entire street. That DSS unit, by the way, works with the police to keep the streets clean of garbage – and on its website, street vendor permits rank alongside warnings about illegal dumpsters and dealers in hazardous waste. There’s another way – tried, tested, and failed so far – that was attempted over at MacArthur Park: get a whole group or consortium of carts together under an official called a Sidewalk Vendor Administrator, add a world class group insurance policy, throw in an industrial kitchen and washrooms paid for by State grant, and hey pesto. Easy. They couldn’t keep the unlicensed vendors out of there, so it was shut down. “The City promotes the City’s aesthetic interests generally and the City is affirmatively seeking to eliminate visual blight on the public rights-of-way, including the visual blight caused by unsightly vendor stands”. Oh dear, no, we can’t be having any of those unsightly blights here! Commander Andy Smith, LAPD quoted in LA Weekly. Earlier Commander Smith had told LA Times: “We’re not in the business of going after people that are selling food or selling items like that on the street. That is the health department”. So that’s OK, then. Anyway, do we really want any of these 50,000 LA street vendors to be legalized? Doesn’t Evan Kleinman get it? “Street food helps make Los Angeles a vibrant place and a great food city. It has the potential to play a vital role in our communities by providing access to good food—food that is healthy, sustainable, fair and affordable”. Late last year, an L.A. council committee took a step toward legalizing and regulating street vending, discussing how sellers could obtain city permits. With legalization will come standards of health and safety which will lift the food and the vendors into the light. Above all, it will mean that honest, good-practice vendors are free from fear. 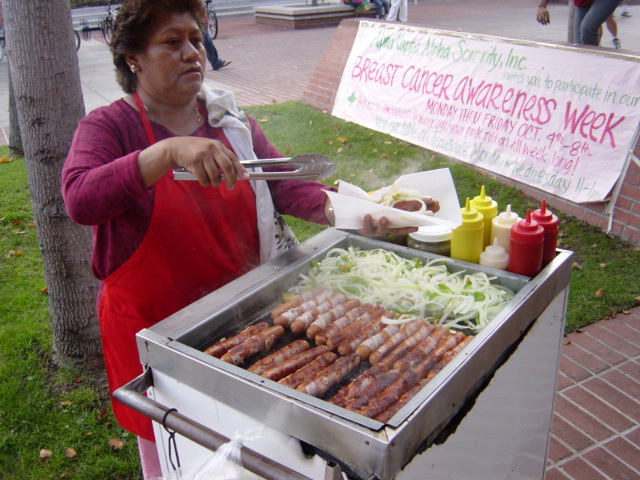 Some, like Elizabeth Palacios (featured in Daniel Hernandez’s LA Weekly article), have spent a long time in jail for selling bacon-wrapped sausages. Others have simply run away from the police leaving their carts and merchandise behind them. “Vendors will have to immediately comply with Health Department regulations, meaning they will no longer be able to prepare food within their homes; they will have to find commissaries or obtain access to a commercial kitchen. That will require an expenditure of capital, which not everyone will have”. So it’s not going to be easy. But at least let’s stop being so sniffy about these carts.